What is it about shredded coconut, that just makes me think of snowflakes. Could it be its crisp colour of whiteness of each shred, maybe it’s the softness as you bite into a ‘sweetie’ and shreds of coconut fall cascading from your bite, maybe it’s the softness of it’s touch and it’s melting texture in your mouth. 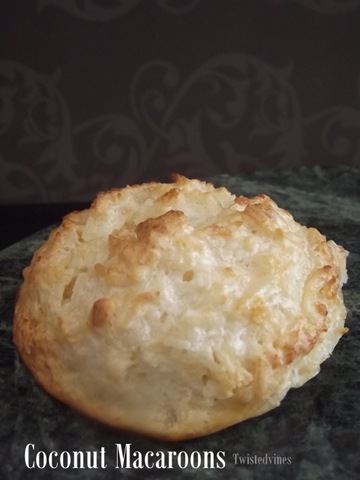 These wonderful Coconut Macaroons are delicate and soft, smooth and melt in your mouth. 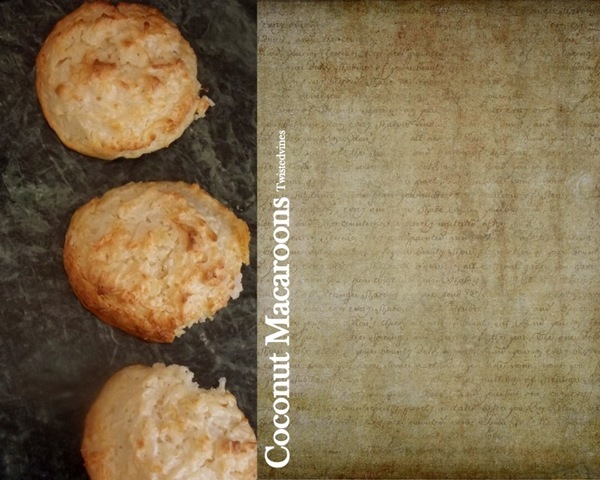 So delicate are these Coconut Macaroons that you’ll forget how many you’ve had. They have a touch of honey ‘sweetness’ and a chewy soft coconut centre. Preheat oven to moderate temperature of 190°C. In medium bowl, combine coconut, vanilla extract, and salt. Stir in honey until well combined. In another bowl beat egg whites until firm peaks form. Fold in coconut mixture, add the cream of tartar. Using an ice cream scoop this is your measuring tool, keeping all the sizes equal. 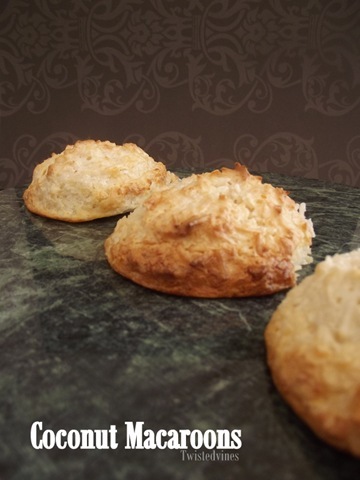 Scoop the coconut mixture onto a prepared oven tray lined with oven proof paper. Bake for 10 –15 minutes until golden brown. Leave to cool. This may be an unpopular opinion but they can keep their Oreos. Give ma a macaroon any day! “Golden droplets” is right, Yvette. These could not look any more enticing. Ooh, I love this idea Yvette and my entire family is crazy about coconut, so nice to get a new idea. I love macaroons. These look delicious! I like the sound of a touch of honey in your macaroons. 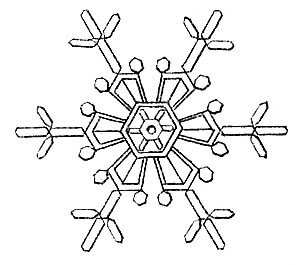 I never thought about the comparison to snowflakes – yet isn’t the wording on the bag something like that? Snowflake (or is it just flake) coconut? And you do make these sound/visually and verbally as though I can taste them. Yum.